I have a friend that lives in the middle of Venice. When I visit the area, she often cooks for me in her flat, taking hours to make fresh meals completely from scratch. The aroma in the room while she is cooking and the flavor of the food is just incredible. The care and thought that is put into the food and meal is really unique. There’s also always good wine, nice appetizers, and talk while the food is being prepared. When I first met her over a decade ago during my first travels through Europe, I asked her what she thought of Americans. She said she they were fine and didn’t show much of a reaction. I then probed a bit more and asked her what the major difference was between Italians and Americans. After a short pause, she looked over at me and said with her heavy Italian accent “well, Italians work to live, and Americans live to work”. Some people may feel a little put off by her remark, thinking she’s taking a shot at people who have a much different work environment even culture than most Europeans. But to me her statement meant no harm, therefore it shouldn’t be taken that way. It also got me thinking about the differences in vacation and workforce policy between the US and other countries – especially in Europe. Many in the U.S. hold high and actually favor the European model of life and work. I obviously like to travel, and the idea of more vacation time is appealing. I’m very thankful and cognizant that I live in a country that has so many hard working people, but I’m still a big proponent of paid time off and vacations for workers. My father was a workaholic, and when I’m into something, I can work on end for hours and hours, nearly blinded to what’s around me. Sure it’s easy to say people should get more vacation time if you don’t run a business or see the cost impacts of doing so. But studies and logic show that people who take vacations are happier and even healthier than those who don’t. And for those who love to travel, time off is essential. Americans work hard, there’s no question about it – we just do. Sometimes it seems like it’s in our DNA from our forefathers who built this country out of the raw landscape that was before them. But other countries work really hard too. And many of those other countries have a great deal more vacation time than do workers in the US. How much more? Well, I think you’ll be surprised at the results. The United States is the only developed country in the world without a nationally mandated or required paid vacation day. You heard me, not one. Over the past 100 years, some legislation mandating vacation for American workers has made it into the political system in the U.S., only to fail before passing. This is a separate argument from the minimum wage although the two are related because of the costs they pass onto the business owners. Even with all of this vacation, some European countries feel they don’t get enough vacation. Can you believe it? French adults vacation three times as much as Americans, taking and using all 30 possible vacation days that are allotted to them. However, according the Center for Economic and Policy Research (CEPR), the French feel vacation deprived, with 9 out of 10 French adults either strongly or somewhat in agreement that they need even more time off! And while 90% of French adults feel vacation-deprived, only 17% of Norwegians feel so. Austria guarantees workers the most time off, and has a legal minimum of 22 paid vacation days and 13 paid holidays each year (or 35 total days off). 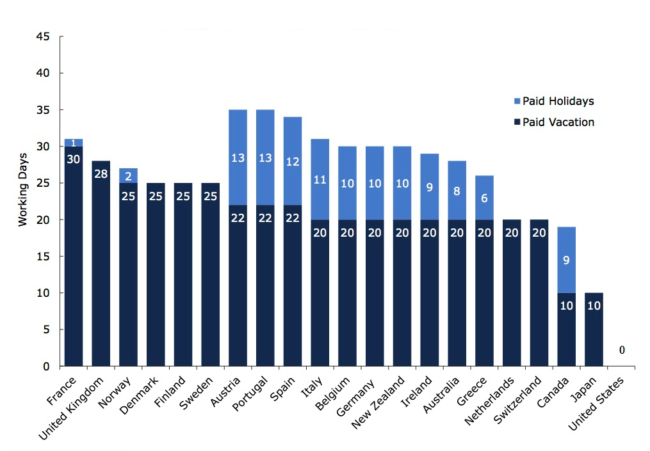 And outside of Europe, New Zealand is the only OECD nation outside of continental Europe that requires workers receive at least 30 work days of paid vacation and holidays combined. The typical U.S. worker at a private company gets 10 days of paid vacation and six paid holidays per year (or 16 total days off). Roughly one in four Americans does not have a single paid day off. The stats seem to paint the U.S. workers in a different light than reality may show. Personally I don’t know anyone without a days off allowance. Just about every person that I come into contact with can either take time off (without pay – independent contractor), or has 10 or more paid days off for the year. People might work 6 or even 7 days a week in the U.S., but it’s also quite common for people here to work multiple jobs for extra money. European regulations that restrict how late business can even be open are much more prolific than the U.S. Some countries even restrict business from the ability to keep their shop open later than their competition because that would create an ‘unfair’ environment. The government in Europe has much more control over business and people’s lives than here in the U.S. Some in the US would like government to mandate more laws to create more parity and equality among workers, but that involvement would diminish the liberty that businesses and individuals have. So a move in one direction has an effect on another. Senior economist and one of the authors of the CEPR study, John Schmitt, says that in the 1970s U.S. vacation policies were roughly on a par with comparably rich European countries. Now that gap has widened dramatically which he links with the growing income inequality among workers at the top and bottom of the pay scale in the US. Vacation time varies so much here in the US depending on your occupation, seniority, time of the job, and other factors that many other countries don’t have. But how much vacation is too much and how much is not enough?